Most lawyers understand the importance of having a good marketing plan. 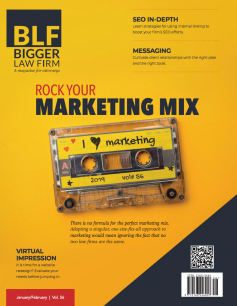 But what many may not realize is that there is no formula for the perfect marketing mix guaranteed to work for all law firms. Adopting a singular, one-size-fits-all approach to marketing would mean ignoring the fact that no two law firms are the same. Law firms vary by location, practice areas, types of clients, experience and many other aspects. Each added variable makes the marketing needs of each firm that much more different and specific. Nevertheless, all of them are united by the reality of having to operate in the hyper-competitive environment of today’s legal industry. According to the American Bar Association, there are more than 1.3 million attorneys in the United States. A law firm looking to the future must employ effective marketing strategies to build a consistent, persistent presence that ensures they stand out from the competition. Lawyers are bombarded with a lot of different — sometimes conflicting — advice from various sources that makes it challenging to figure out the right marketing approach for their law firm. Tactics that work for one law firm may not work for another, and vice versa. Additionally, what was effective one quarter for a firm may need to be modified the next. So what can lawyers do to determine their ideal marketing strategy for success in 2019? To figure out their best marketing mix, law firms should start with a comprehensive review of their existing efforts to determine what is working and what is not. This includes identifying their target audience. There is no point in implementing a marketing strategy if it is not reaching the right people. Develop specific profiles including characteristics that define an ideal client, demographics, the legal services they seek and where they are searching for them. The more deeply lawyers understand who their potential clients are, the easier it is to develop targeted marketing processes that meet their specific needs and deliver results. Certain marketing channels will be more relevant than others, simply because of your ideal client’s behaviors. For example, a law firm that targets younger clients who actively use smartphones may find online marketing strategies like social media and videos to be the most effective. PPC advertising may prove more useful for attracting potential clients facing urgent court dates or jail time. Because they are inclined to act quickly, the precise targeting capabilities of such ads can help your law firm be the first to appear in the individual’s search results. Another aspect law firms need to consider when determining their ideal marketing mix for the year ahead is their goals, whether it is increasing revenue or attracting new clients in a particular practice area. Many lawyers fall into the trap of experimenting with different tactics rather than establishing an overall strategy when it comes to their marketing. Focusing on the “why” will help you choose the right marketing channels to drive your law firm’s objectives into fruition. Otherwise, your marketing efforts will lack direction, and there will be no way to determine whether they are paying off. In addition to target audience and goals, a crucial deciding factor when it comes to picking the right marketing tactics is budget. How much can you invest in marketing this year? Do you need to raise last year’s budget to get better results? Which marketing channel is going to produce the highest return on investment (ROI) based on who you are trying to reach and what action you want them to take? Various factors, such as how competitive your space is, will affect the amount your law firm needs to spend in order to reap the benefits of a particular marketing channel. Gone are the days of prospective clients relying on TV commercials or phone directories. Today, people are searching for lawyers both offline and online. This means law firms have multiple tactics to choose from when developing their marketing strategy. Every firm needs a good mix of marketing channels, but the combinations they choose will vary according to their target clients, goals and budget, among other factors. A multinational corporate law firm is going to have different requirements than a smaller niche practice. A criminal defense lawyer in New York will have a different target audience than a personal injury attorney in Florida. Online legal marketing in itself is a vast universe made up of search engine optimization (SEO), email marketing, social media, content marketing, pay-per-click (PPC) ads, directory services and more. Certain tactics, such as having a regularly updated law firm website, are considered mandatory if you wish to achieve marketing success. For millions of people, the first step in finding a lawyer is a Google search. As a result, SEO has become integral to online marketing. Due to the intense competition for visibility on the web, marketers use SEO to increase reach and prominence on search engine results pages. However, law firm marketing is not limited to the web. SEO and other online tactics must work harmoniously with offline marketing channels like advertising and networking to help establish a law firm as a trustworthy authority. In an era geared toward online communication, offline advertising still has value. People have not stopped listening to the radio, watching TV, reading brochures or looking at billboards. Branding is another inherent part of marketing for just about any law firm. When people think of brands, big names like Amazon or Apple immediately come to mind. But branding is just as essential for law firms as it is for multinational corporations. It is more than a logo or visual style. Branding involves crafting an image and message that lawyers want to convey to the world, including what sets their firm apart from competitors. Once a law firm’s branding is established, it should be incorporated consistently across all offline and online marketing channels, whether it is the law firm website, Facebook page, business cards or other published materials. Branding allows lawyers a measure of control over how their firm is presented to their current and prospective clients. A lot of modern-day communication occurs online via email and social networks like Twitter and Facebook. However, this does not diminish the significance of real-world networking. Clients still form their primary impressions of lawyers through face-to-face meetings, and word of mouth remains a powerful force of advertising for law firms. Offline relationships, such as networking with colleagues, can serve as a rich source of business. When lawyers join professional associations and attend conferences, they encounter people who can refer clients to them. For example, an attorney may know of someone looking for legal representation in a practice area different to theirs. In a 2018 Thomson Reuters survey, small law firms identified increasing referrals from existing clients as the top factor that drove firm revenue over the past year, followed closely by growing relationships with current clients. 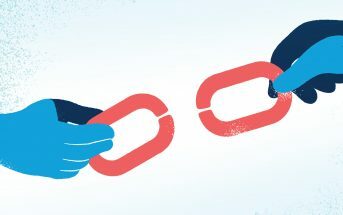 Referrals play a crucial role in new client acquisition for many lawyers, especially for smaller law firms that may not have thousands of marketing dollars to spend on more costly lead generation tactics such as SEO or PPC advertising campaigns. They are likely to benefit from leveraging their existing network of relationships that hold potential for driving referrals and repeat business. A prospective client looking for legal advice is more likely to trust an attorney with whom a friend, coworker or acquaintance has had a positive experience. In addition, the cost of acquisition for referrals is typically much less than a client acquired through other means, even when referral-generating tactics such as email newsletters or social media marketing are used. 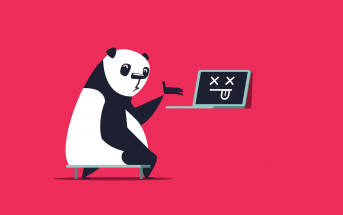 While email marketing may conjure up images of spam clogging up inboxes and unwanted messages destined straight for the trash, people continue to find businesses through marketing emails every day. When used correctly, email marketing serves as an effective trust-building tool for law firms. Lawyers can benefit from having an email newsletter that goes out to their entire network on a regular basis. Make sure to provide engaging content in the emails, whether it is highlighting a new legal service being offered, or sharing the successful outcome of a recent case. By offering value to the email recipient, you increase the chances of them remaining a long-term loyal subscriber and supporter of your firm. Law firms sometimes dismiss social media as gimmicky or frivolous. However, it is impossible to ignore the fact that it has become inextricably woven into our daily lives. Just as with email marketing, the trick is to provide high-quality content that your target audience will value. The challenge lies in finding out which social media platforms they prefer and how they use them. Remember, not all platforms lend themselves well to the objectives of every law firm. An active presence on major platforms — like Facebook, LinkedIn and Twitter — gives law firms the ability to quickly and easily engage with their network and connect with potential clients. It is the virtual equivalent of shaking hands with your followers. Additionally, lawyers can use advertising services that are available on some social media platforms. Pay-per-click (PPC) advertising remains one of the most effective ways for law firms to market their services on the web in 2019. The benefit of paid online ads is that they are shown to people at the exact moment they are searching for legal services online. Google Ads provide visibility to law firms that offer services that people are searching for. Ultimately, search engines care about meeting the needs of their users. Your ads should be helpful, acquire quality leads for your firm and not exceed your earmarked cost per lead. However while paid ads can deliver results, they can be costly and have become increasingly competitive. Law firms can keep their ad relevance high and cost per click low by using dedicated landing pages on their website. If your site is well-structured and geared toward people who need your services, every click through is a potential conversion that maximizes the value you receive from investing in such ad campaigns. 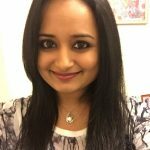 Lawyers should also take advantage of remarketing, a technique that involves targeting prospects who have visited your site in the past. Content marketing involves creating informative, engaging content that appeals to both current and prospective clients. More and more law firms are using it to differentiate themselves from their competitors and establish themselves as authorities in the legal field. Although content marketing is often thought to be synonymous with written material, it is actually an umbrella term for a variety of mediums including videos and podcasts. A comprehensive marketing strategy will consider the value of using different types of content to attract prospects. Video is set to enjoy growing popularity in 2019. According to Cisco, 80 percent of all online traffic will consist of video by the end of this year. Law firms can use videos to introduce attorneys or offer actionable information on various legal subjects, to name a few ideas. For example, a personal injury attorney can discuss key things to remember after a car accident. Videos can be shared across multiple platforms including a law firm’s own website, social media and YouTube for maximum exposure, depending on where the target audience spends the most time. They are especially useful for law firms looking to engage and attract a younger clientele. Some law firms may also want to add podcasting to their content marketing mix to really stand out. Edison Research and Triton Digital found that more than 25 percent of Americans are monthly podcast listeners. With audiences continuing to grow, podcasting can be a cost-effective way of expanding your reach to potential clients and other audiences. Blogging, perhaps the most dominant form of content marketing, remains a reliable way to draw in new clients and earn organic traffic. Whether it is answering frequently asked questions or addressing changes in laws, a website’s blog content presents a great opportunity for SEO as long as you refrain from practices like keyword stuffing. With the right mix of content, law firms can attract traffic, boost search engine rankings and reinforce their unique brand. Online legal directories can help law firms enhance branding efforts and build name recognition within the legal industry. Some well-known legal directories include Avvo, Lawyers.com, Martindale, FindLaw and Yelp. Law firms should make sure their listings across all these websites are uniform and correct. List the firm’s name, contact information, website and business hours so that potential clients can find you easily. The more places lawyers can have an online presence, especially one that is locally targeted, the better. Developing a marketing strategy involves measuring the success of a law firm’s various choices so that time and money are not wasted on marketing efforts that are ineffective. Marketing strategies need to be constantly refined using real data to determine what messages resonate with clients and through which channels they should be delivered. Lawyers have at their disposal various tools across different platforms that provide insight into the returns on their marketing investments, as well as metrics like customer acquisition cost and cost per lead. 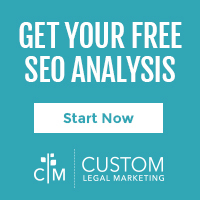 Since Google is the dominant search engine on the market, lawyers can use a number of free Google services — like Google Analytics and Google Search Console — to track their site traffic across the web. 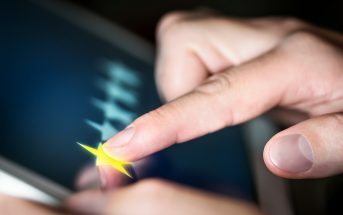 Social media sites also have their own analytics to measure engagement and help lawyers understand the value of their efforts. Additionally, firms using podcasts and videos can track performance statistics such as the number of downloads or subscribers. Effective marketing is a process that involves figuring out how to convey the desired message to the right audience at the right time. Once law firms have identified a marketing strategy in which all these aspects align, they are positioned for success and growth. However, the key is to remember that marketing strategies are not stagnant. They must adapt as expectations and requirements change over time.